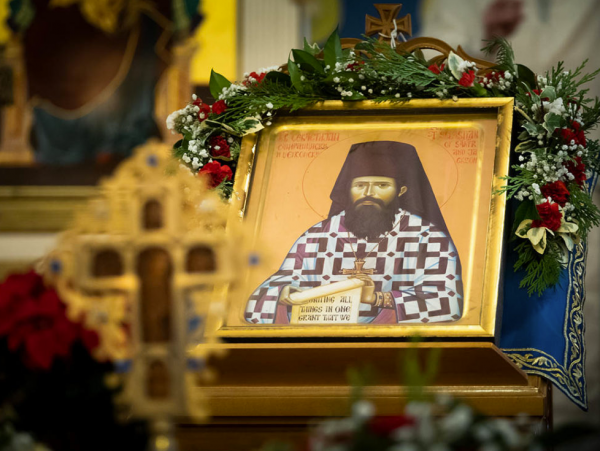 Saint Sava Church in Jackson, California, for the fourth time celebrated the feast day of its founder, Saint Sebastian of Jackson, an Apostle of America, in the 2018th year of the Lord, with great joy and love. Holy Missionary Sebastian (Dabovich) of Jackson: Proclaimed New Saint of the Orthodox Church! Although on a week day, Friday, the church was filled with the faithful from various Orthodox churches and from various places of California, who all desired an encounter with the great man in whom God is well-pleased. Like last year, priests from a few neighboring Serbian and other Orthodox parishes gathered together for Divine Liturgy, but a special joy this year was brought by two guests from afar. One of them was Presbyter Miroslav Andrić from Kraljevo, a city near Žiča Monastery, where Saint Sava, the patron of Jackson’s church, was enthroned and where his archiepiscopal see was, and where Saint Sebastian, its founder, fell asleep in the Lord and reposed on its cemetery from 1940 until 2007. The other one was Deacon Simon Menya from Uganda, who is a student at Saint Vladimir’s Orthodox Theological Seminary in New York and is getting prepared to be involved, like Saint Sava and Saint Sebastian, in the missionary activity in his homeland. As a true man of God, Saint Sebastian calls all and gathers all around the Lord, without any worldly partiality and discrimination, so that all His children may be one in Him. After only three years since his name was inserted into the diptychs of saints, his church has been visited and his holy relics venerated by the pilgrims from all over North America as well as all other continents of the globe. Only three years later, the family of Jackson’s deputy sheriff celebrated Saint Sebastian as their family patron saint or Slava for the second time and this time they were joined by the local photographer Lazar Larry Angier, who was baptized and christmated earlier this year and who enjoys high reputation not only in his native region but throughout the fullness of our Church for his dedicated art work and unselfish contribution to capturing and depicting glimpses of its heavenly and eternal beauty. Among the most joyful celebrants was a small Sebastian, who was brought to the church from Sacramento by his parents, Moldovan father and American mother, in order to celebrate his first Name Day together with his namesake and patron saint. At this occasion, the parish also commemorated the fourth anniversary of ordination of its deacon, Dragan Stojanovich. One of the oldest and most respected families of Jackson is the Vukovichi, who originally came from Herzegovina. Interestingly, one Vukovich on the other side of the ocean, a young lawyer from Belgrade, Serbia, started celebrating Saint Sebastian of Jackson, in addition to his traditional, ancestral Slava, as a special Slava or home and family patron saint. Let us also say that the Jackson’s shrine was blessed since the previous celebration of its founder with the particles of holy relics of Saint Mardarije of Libertyville, who is a founder and pillar of our Church in North America together with Saint Sebastian of Jackson, as well as of Saint Sebastian the Martyr, on whose feast day Saint Sebastian of Jackson was tonsured a monk and was named after him.